Classical mechanics, sometimes called analytical mechanics, is the part of physics that deals with motion and forces but within some limitations described hereafter. Its best known formulation is Newtonian mechanics, named after Isaac Newton, but among scientists the formulations of Lagrange and of Hamilton have possibly been more influential. The term classical mechanics is often taken to include special relativity, formulated by Albert Einstein in response to challenges to Newton's formulation raised by the electromagnetic theory of Maxwell. Newtonian mechanics is therefore often referred to as nonrelativistic classical mechanics, and likewise, relativity as relativistic mechanics. In this usage, the adjective classical is taken to distinguish this formulation of mechanics from quantum mechanics, and from developments in quantum field theory, in particular, quantum electrodynamics and the Standard Model of particle physics. As with any scientific concept, classical mechanics has a limited range of validity but here the range is quite large and covers most everyday events. For example, Newtonian physics works well for ordinary situations such as a car changing lanes or a football flying through the air. The behaviour of objects travelling at speeds approaching the speed of light, however cannot be described by Newtonian physics and for such situations special relativity must be applied. Classical mechanics is incapable of describing some regimes, however. For interactions involving very small objects, like the atomic and molecular behavior studied in chemistry, quantum mechanics must be applied for accurate results. For the full range of interactions between elementary particles (between the hadrons and leptons) and also for the treatment of nuclear forces, the Standard Model of particle physics is required. A full treatment of gravity also transcends classical mechanics and requires the general theory of relativity, which treats the non-Euclidean distortions of space and time caused by energy and mass. A unified treatment of gravity and the Standard Model remains a challenge to modern physics. This article will focus upon Newtonian mechanics. Locating a particle in two coordinate systems, S and S'. Classical mechanics deals with particles; such bodies can be called also material points. These bodies are described in terms of their coordinates in some specific reference frame. One can imagine the reference frame as a ruler with marks that give values of the coordinates. In 3-dimensional space, the coordinates of each body can be treated relative to three mutually perpendicular rulers, providing locations as 3-vectors, for example, an ordered triple: [x, y, z]. Also, in Newtonian mechanics, it is assumed that there exists time, universal for all the frame references, and the coordinates of all the bodies are smooth functions of time. The bodies are allowed to interact. The interaction is characterized with forces. The forces are treated as 3-dimensional vectors. If several forces act on the body, their equivalent effect is that of a single force that is the vector sum of all forces applied. Each body is attributed some positive real number called mass. The mass of each body determines, how the body reacts to the force by other bodies. The mass of a system of some bodies is equal to sum of masses of these bodies. The mass of a closed system is preserved. 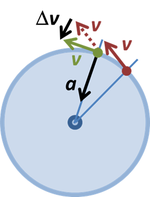 Changing velocity direction in circular motion at constant speed implies a radially inward acceleration. The green and the red velocity vectors have the same size (speed is fixed) but differ in direction. In a one dimensional system (as used above) the term speed could be used instead of velocity. However, in more dimensions, the difference between a vector quantity (like velocity which has a magnitude and a direction) and a scalar quantity (such as speed which only has a magnitude) is very important. As with velocity, in a space with more than one dimension acceleration is a vector. Moreover, a change in the direction of the vector velocity results in a vector acceleration. As a particular example, a particle moving in a circle at constant speed has a continuously changing direction, so its velocity is continuously changing direction, implying the presence of an acceleration. In this particular case, this acceleration is called a centripetal acceleration, referring to an acceleration toward the center of the circular motion. The figure shows the velocity tangent to the circular path at two nearby times. By translating the velocity vector at the earlier time to the position of the later velocity vector, the difference Δv in the velocities is found. Dividing by the time difference Δt and letting this time difference approach zero, the radially inward acceleration a is determined. One of Newton's inventions, calculus, which was simultaneously and independently invented by Gottfried Wilhelm Leibniz, is useful in mechanics. Acceleration is the derivative of velocity (with respect to time), which is the derivative of displacement (with respect to time). or in words, the square of the hypotenuse R of the right triangle with legs x and y is the sum of the squares of its legs. Thus, |r| = R, the radius of the circle, as is expected. In words, the centripetal acceleration increases linearly with the radius of the motion and parabolically with the angular rate of rotation. It can be seen that the use of calculus makes such considerations amazingly easy. Inasmuch as this constant-speed circular motion implies a centripetal acceleration a, it follows that in order for a body of mass m to pursue this motion, it must be subjected to an external centripetal force, m a , provided in the case of the (approximately) circular travel of the Moon about the Earth, for example, by gravitational attraction. The motions of moving objects differ depending upon the observer watching them. For example, the observer may themselves be in motion, which will affect how they see the motions of the objects they study. For this reason, Newtonian mechanics does not apply the same way for all observers: observers in uniform translation with respect to the fixed stars (shorthand for the Universe as a whole) have the simplest description of motion and are called inertial observers. On the other hand, observers accelerating with respect to the fixed stars (noninertial observers) can use Newton's laws, but only by introducing inertial forces, that is, forces related to their acceleration, which are additional to the forces used by inertial observers. Examples are centrifugal force and the Coriolis force used by rotating observers (like us on the spinning Earth, orbiting the Sun, moving with the Milky Way). It is evident from this last equation that should the old frame be accelerating relative to the new frame, that is, A ≠ 0, then the force on the particle, being proportional to its acceleration, will be different in the two frames whenever they are mutually accelerating. Newton's laws of motion help to analyze the principles of dynamics, the relationship of forces to the motions they cause. They also serve the "flip side" of dynamics, namely kinematics, which determines from observed motions the velocities and accelerations associated with those motions, and by implication, the forces necessary to produce those motions. These three laws were first published in 1687 in Philosophiae Naturalis Principia Mathematica. The following is a modern version of these laws; the original laws in English translation are provided in the footnotes attached at the end of each law. Such a reference frame is called an inertial reference frame. Any reference frame that moves with constant velocity with respect to an inertial reference frame is also an inertial reference frame. This property of bodies in classical mechanics to maintain a state of zero acceleration is called inertia, a tendency to keep moving in the same direction until another force causes it to stop or change direction. By default, unless otherwise identified, the reference frames of a discussion are assumed to be inertial. where F is the net force needed to cause an acceleration a in a body of mass m. Note that F and a are vectors, thus a change in the direction of motion is also a form of acceleration. An illustration of forces acting on an object. g is the acceleration due to the Earth's gravitational field. The object is at rest. This law is less formally stated as; every action has an equal and opposite reaction. It's important to remember these two forces act on different bodies. For example a ball thrown in the air is pulled towards the centre of the Earth by a force due to the Earth's gravity and the ball is exerting a force of equal magnitude pulling the Earth towards the ball. Although the two forces have the same magnitude, in accord with the third law, the acceleration of the Earth induced by the force of gravity from the ball is negligible according to the second law, because the Earth has a much larger mass. Another useful example is attempting a tug of war on ice skates. No matter who is stronger, the person with the largest mass will inevitably win. These laws are valid only in an inertial frame of reference or, as Newton called it, in absolute space. While Newton's laws can be stated easily, it can be hard to apply them to real-world situations where there are many different forces acting on an object. When two interacting objects contact each other, there are contact forces in play: usually a normal (perpendicular) force and a friction force. The friction force always acts in a direction opposite to the direction of an applied force (it opposes the change). The energy of any isolated system remains constant. Apart from Newton's formulation, classical mechanics can also be expressed in the Lagrangian and Hamiltonian formalisms. These formulations are based upon energy: potential energy and kinetic energy, which are scalar quantities, rather than directed quantities like velocity and acceleration. The energy of an isolated system is conserved during its motion, and that determines its evolution in time. Such formalisms become important in applying Newtonian mechanics to complicated systems of particles. The consideration of systems of point particles with fixed distances between them leads to rigid-body mechanics. The consideration of a deformable body leads to the theory of elasticity, and consideration of liquids and gases is called fluid mechanics. In addition, the Lagrangian or Hamiltonian formalism simplifies treatment of systems with holonomic constraints, that is, those with relations between the coordinates describing the system that are maintained during its motion, like the length of a robot's arm that connects its elbow coordinates to its wrist coordinates. Many such constraints have application in mechanical engineering. The Hamiltonian formulation of mechanics is used to guide the transition from classical mechanics to quantum mechanics. The Lagrangian formulation of mechanics, employing Lagrangians different from those of Newtonian mechanics, is the basis for the formulations of quantum field theory that underlie the Standard Model of particle physics. The concepts of Newtonian mechanics such as absolute space coordinates and universal time have a limited range of validity, restricted to speeds much less than the speed of light in classical vacuum. These ideas are generalized to the combined space-time coordinates required by Maxwell's equations in the special theory of relativity, making neither space nor time coordinates absolute. Newtonian mechanics works for slow objects; in some reference frame, the speeds or all the objects should be small compared to the speed of light. This limit follows from the postulate that no one material object can move with speed of light or faster. If some spacecraft during long time moves with the same acceleration at all time, say, g, then, within Newtonian mechanics, one would expect its speed to be linear function of time and increase indefinitely. However, in special relativity, the acceleration defined as second derivative of the coordinate with respect to time varies in such a way that the velocity of the accelerating spacecraft approaches c, but never reaches it. This more general branch of classical mechanics that deals with higher velocities also is called relativistic mechanics. The basic laws of conservation in relativistic mechanics are the same as in Newtonian mechanics, but such concepts as momentum and energy have to be redefined; the momentum of a particle cannot be expressed as the product of its rest mass with its velocity, rather the relativistic mass of a body varies with its velocity, deviating from its rest mass at zero velocity; a redefinition of energy also is needed. where is the Planck's constant. For consideration of movements with action of order of Planck's constant or smaller, the concept of coordinate becomes a rough approximation or just invalid; and the quantum mechanics should be used for the description of the system. Usually, this refers to the atomic and molecular systems. However, some pretty macroscopic objects (for example, the electromagnetic field in a superconducting cavity or in a system with counting of individual photons) may require the quantum description. In the case when the speed is high, and the action is small, the creation of new material objects (particles) becomes possible. In this case one cannot use the concepts of mechanics in a common-sense manner: not only the coordinates of particles cannot be precisely determined, but the number of particles need not be a simple integer. The very notion of a vacuum becomes complicated by the possible fleeting presence of particles. These extreme cases require quantum field theory, specifically, the Standard Model. The isotropy and homogeneity of space–time is a basic concept of mechanics, both classical and quantum, and both relativistic and non-relativistic. However, this homogeneity is only an approximation: the gravitational interaction disturbs the metrics of the space. This disturbance may be significant in the presence of huge masses in the vicinity of a physical system. Space has also quantum fluctuations of metrics and even topology. In such a way, a smooth and flat space and time, as used in classical mechanics, is just a very good approximation. This approximation is expected to be valid for separations much larger than the Planck distance, and time intervals longer than the Planck time. These scales of space and time are really small; at the beginning of the 21st century, no one experiment has approached this scale measuring time and distance. Classical mechanics has fundamental limits. The devices for measurement of distance cannot be very small and very light; otherwise, they, by themselves, become quantum objects. The devices cannot be too heavy; otherwise, they disturb the metrics of space due to the gravitational interaction. In this sense there is no physical regime in which classical mechanics is "mathematically exact". However, the range of masses and velocities and the precision of the physical devices, is many orders of magnitude far from these fundamental limits. In particular, all mechanical machines, including spacecrafts and satellites, are described within classical mechanics, and extremely precise measurements are necessary to see the deviation from the laws of Newton due to the relativistic effects. At least for the beginning of the 21st century, such a deviation appears only in the second order of the perturbation theory with respect to v/c, and deviation from Newtonian mechanics is of the order (v/c)2. Even at cosmic speeds, say, v/c = 10-5, the relative deviation is at the level of 10-10 and is barely detectable by ordinary means. Similar estimates can be done for the quantum effects. In this sense, classical mechanics is a very precise science. These are the laws as originally proposed in Newton's Principia, from the Andrew Motte translation (see link to this source in the References section). ↑ Every body continues in its state of rest, or of uniform motion in a right line, unless it is compelled to change that state by forces upon it. ↑ The change of motion is proportional to the motive force impressed; and is made in the direction of the right line in which that force is impressed. ↑ To every action there is always opposed an equal reaction: or, the mutual actions of two bodies upon each other are always equal, and directed to contrary parts. Frequently the concept of "change of motion" is taken to mean "change of momentum", that is change of m v, and not just a . The background of the term "change of motion" is quite involved, so its interpretation is a challenge in putting the original Latin correctly into a wider historical context. By taking the laws to refer to change in momentum, Newton's laws become more compatible with special relativity, where rest mass (mass of an object that is stationary) differs from relativistic mass, which changes with change in velocity. ↑ Herbert Charles Corben, Philip Stehle (1994). Classical Mechanics, Republication of Wiley 1960 2nd ed. Courier Dover Publications, p. 287. ISBN 0486680630. ↑ An English translation is found at Sir Isaac Newton (1934). Philosophiae naturalis principia mathematica, Andrew Motte translation of 1729, revised by Florian Cajori. University of California Press. ↑ Cornelius Lanczos (1986). The variational principles of mechanics, Reprint of the University of Toronto 4th edition of 1970. Courier Dover Publications. ISBN 0486650677. ↑ 4.0 4.1 William S. C. Williams (2002). “§4.3 Relativistic mass”, Introducing special relativity. CRC Press, p. 49. ISBN 0415277620. This page was last modified 00:25, 23 December 2011.